-Launch:November 18th in North America, and November 30th in Europe. -Price: NA: $300 for the basic edition, $350 for the deluxe edition. EU: depends on retailer. -Nintendo TVii announced. It's basically an entertianment service for movies/sports/tvshows similar to what is being offered on other console counterparts. It's Free to use but requires subscriptions with Netflix, Hulu Plus etc.to actually watch content. -Launch Window titles (November 18 -End of March 2013): New Super Mario Bros. U, Nintendoland, Bayonetta 2 , Monster Hunter 3 Ultimate, Rayman Legends, Zombie U, Pikmin 3, COD: Black Ops II, Assassin's Creed III and several others. I put up a video summing up the things that I thought stood out to me the most, so give it a look here! IMO If I had $350 to spend it on console, it wouldnt be Wii U.
PS3 that can do exactly same thing but also get larger HDD and use it as Blu Ray. 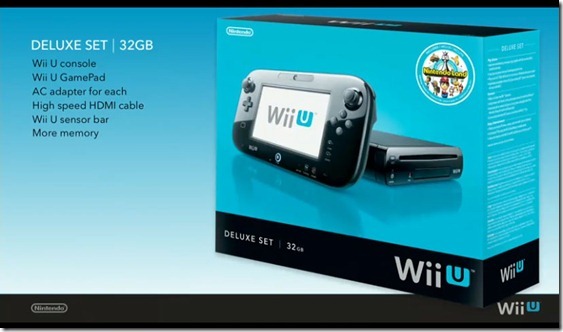 As someone who isn't sure about buying the Wii U, the launch lineup doesn't do it for me. On average it's probably the best Nintendo has ever had but there isn't a single AAA, system moving title ala Mario 64 or Twilight Princess. New Super Mario Bros and Rayman Legends will be fun but they are old school 2D platformers and don't really showcase what makes the Wii U better or different. Nintendoland screams casual and gimmicky. Bayonetta 2, Pikmin 3 and Monster Hunter 3 Ultimate are very strong AA exclusives but again, not system sellers (well, Monster Hunter maybe but only in Japan). Mass Effect 3, Black Ops 2, and Assassins' Creed 3 are non-exclusives and everyone's already played the first one anyways. The $150 controller presents a problem too. I like to have friends over or go to their place to play games in side by side in the same room. How are good multiplayer games taking advantage of all the features of the Wii U going to be developed if only one person has the GamePad? Will buy for whatever new Smash Bros title comes out. 1. Can you play the Wii U entirely WITHOUT connecting it to a TV, that is only using the hand controller? 2. Can you play the Wii U online with matchmaking and stuff, like XBox Live service? you can all play with normal controllers. The gamepad is just an added bonus. 1. For Games, some support the feature while others don't. As for the system running straight out of the box without any TV requirement, details are still scarce. 2. Yeah Wii U is going to have Nintendo Network, which is like XBL/PSN. I exclusively want Wii U for new Super Smash, don't think I can justify buying it yet, but goddam I want more SSB, thats the game to play at my house. Yeah Smash is in development right now so I'm guessing we might see it by 2014, maybe end of 2013 if we are lucky.